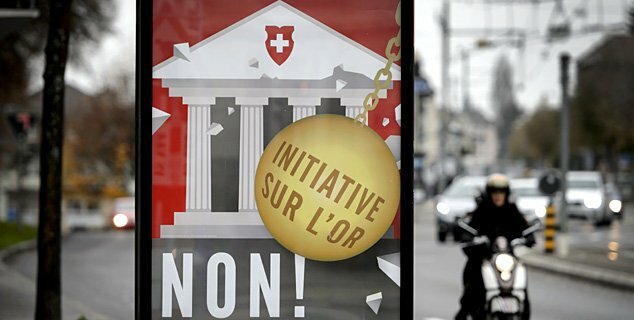 The Swiss referendum that would have required the Swiss National Bank (SNB) hold 20% of its reserves in gold has been rejected by the majority of voters. Early projections from Swiss broadcaster SRF show 78% of voters rejecting the change. Two separate proposals that would have curbed immigration and closed a tax loophole for foreigners were also easily defeated, according to projections. Under Swiss law, any petition signed by 100,000 voters must go to a national vote. Past referendums have covered topics as varied as gun control, a public smoking ban, allowing shareholders to limit executives’ salaries, and assigning state legal aid to animals that might have suffered abuse. Gold bugs were optimistic about the vote in early November but in the past two weeks hopes began to dim. On Friday, gold fell $24 to 1167, the lowest since November 14. The plan’s proponents wanted one fifth of the SNB’s reserves to be in gold, which would have involved buying about 1,500 metric tons in the coming 60 months. Switzerland’s wealthy residents drawn to the tax haven also looked set to offer their thanks to ordinary voters. A bid to scrap the “Pauschalsteuer” – a controversial law allowing Swiss residents who work outside to the country to pay tax on their spending, not their income – also looked set to fail just over an hour after polls closed.